Thank you for the heads-up [Defensive Cycling procedures for dismissing a ticket], the great service and course. I am glad I learned about it from a friend. I have to say that I learned a lot from the course and I now feel I am a safer rider. Thank you so much for the course and your help! I appreciate it! Very informative and easy to use. I learned a lot! 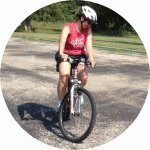 I just completed the online bicycle course. I wanted to tell you that I found it really helpful and thorough. I have been a bike commuter for 6 years and recently got a ticket for running a red light on my bike. The information in this course is really valuable and I would love to see it made available to drivers as well. I’m sure you know that many drivers (and cyclists) are not aware of Texas law regarding bicyclists’ roles on the road. It makes me happy to see the time and effort put into developing such an informative course like this. I just feel it important to tell you that the CCE and its staff are really appreciated. Thanks for spreading awareness and trying to improve the cyclist/driver relationship! I liked the amount of resources given during the modules. The ability to see the actual laws about transportation and bike safety are important. I also appreciated the videos. But the best part of the course was the customer service. Thanks Allan for everything! Loved it! Got the chance to learn some city-specific regulations and it was exactly what I was looking for. Great course. I learned a lot of information about cycling that I had no knowledge of and I also learned information specific to Austin which is helpful because it’s my place of residence. I like the modules, how interactive it is, and that it has visuals and hearing aids to reinforce the content. I definitely recommend this and honestly it would be great if all cyclist and pedicabbers took this course. Good information and easier instruction how do the course. This was excellent!! Thanks, Allan! I really appreciate your efficiency and I will be recommending your course to all cyclists. I learned quite a bit. This is such an excellent resource. I’ve been commuting to school/work for 12 years and consider myself to be a pretty good rider, but I learned so much here. I’ve read plenty of things online and even a few books, but this addressed a lot of concerns I had and presented new info in a way that’s easy to comprehend (the graphics and videos helped a lot). I liked that I could go back in when I wanted and it kept my place. I’ve been trying out what I learned on my rides this week, and it’s already making a big difference. Thanks! This was a very good course! Glad I reviewed all these things because I wondered how to deal with a lot of scenarios with intersections, the end of a bike lane, etc. Everyone who commutes with a bicycle should take this course! Great class, learned more than I thought I would. 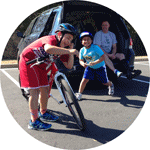 Relevant information, with tips for beginning and advanced cyclists. Also provides a good user experience and it’s clear. I was surprised at the high quality of the course! Very informative, easy to follow along, and good information for a variety of situations/scenarios. Really enjoyed it and the videos really matched up well with the information. This was surprisingly informative. I learned a great deal and was constantly eager (and will continue to be so) to share new knowledge with the community. Thanks for the opportunity to learn and become a better rider! It is a great course, very well explained and it has helped me very much in real life experiences!! The course was actually quite informative and enlightening. It revolved around common sense and real mental thinking. I appreciated it. Thank you for not making it childish. Lovely! Thank you for addressing polite road behavior. This was much better than driver’s training courses I’ve had to take for cars so kudos on that. I’m a highly experienced biker and still got some good stuff out of it. Very clear and easy to understand. Good mix of text, video, and images to explain. Concise plain-english instruction, accessible to those not keen on mechanics or legal issues. I think you (and the team) have done a great job of increasing awareness and informing the public. I think it´s a great course. I learned a whole lot!!! I had no idea there was all that involved. Really nice work. The photographs, diagrams and video clips were particularly helpful. The information provided was direct and concise. Thank you for making the process very smooth and convenient! I had a very positive experience and have already recommended this course to others! Well done service! Keep up the great work and thank you for making it easy for us to learn. Narrator’s perspective seems both compassionate and logical, love it. I very much appreciated the cyclists’ “for us, by us” presentation. Very well written. thoughtful and in-depth. good variety of materials and interaction. I’ve taken two online defensive driving courses. Both were torture, so I was dreading taking this course, but I have to say that I’m really impressed. The site is very clean and easy to navigate. The material was clearly prepared by Austin cyclists for Austin cyclists, which helped keep me engaged throughout. I particularly liked the emphasis on being friendly and courteous on the road to encourage a positive, cooperative environment. Good stuff. The “duh” material was kept short, and I even learned a thing or two. Most of all, thank you for not forcing me to stay on each page for a minimum amount of time so that it all added up to at least 3 hours. That shows that your goal here is to get me to understand the material, not to waste my time, which I really appreciate. All of the above made this as positive an experience as I could have hoped. Very thoughtful…I like the simple element/dictum: remember we’re all human. I’ve changed several habits since I took the course – am actually stopping at stop signs where I think no one is looking, taking more lane, staying in line at the lights and using more signals. Thank you again for the awesome class! It was definitely very helpful and informative. Very helpful and empowering. I feel like I will be a safer and more confident rider. I enjoyed it. I didn’t expect to learn anything new, but I definitely did. Informational, instructor was knowledgeable and respectful. Made following laws seem necessary & easy to integrate into riding style. Great course. Great info. Thanks! Glad it was taught by cyclists. I thought it was an excellent course! The clarification of various street laws improved my confidence in riding on the road. I liked the aspects of psychology involved. I thought it was amazing. I wasn’t looking forward to coming, but it has enlightened me a lot and now I need to stop riding selfishly. I liked how common sense it was. I also liked how you encouraged us to communicate w/ drivers & just think about the signals we send. good course — I’ll definitely be applying some of the things I learned, and I think I’ll be a safer cyclist for it. Great job presenting a lot of info in an effective manner. Great instructor w/ lots of experience to draw from. Very helpful. I think a lot of people should take this. Showing videos of how to signal in different situations was helpful. Very informative and helped clear up many questions I’ve had as a daily commuter for 3+ years. ‘D’* moved to the United States in 2006. Growing up in Peru, she wasn’t allowed to ride a bike. While watching the movie ‘Wadjda’ (about a young girl in Saudi Arabia whose story closely matched hers), she decided it was time, and called soon after getting out of the theater. This is the result of her first lesson. Every time this happens, the hair on the back of my neck stands up and I want to jump up and down and just laugh at the thrill of being a witness to such a moment. * Her name is withheld by request, but she’s happy to have the video posted. Thank you so much for a fantastic and truly enjoyable experience. I really appreciate your approach to learning how to ride a bike, it makes so much sense and I wonder how any of us learned any other way. You were very attentive and they both responded well to you and your methodology. I appreciate how you tailored your lesson to each individual child, being mindful of my younger one’s attention challenges and my older one’s desire to “cut to the chase”. I was shocked that you had her riding within 40 minutes…! Trust me, she is bragging about it but I am keeping her in check since it took her brother longer to get his groove on….your patience is truly abundant! The whole process was tremendous for us, it really boosted their overall confidence in being able to conquer new challenges…in fact, they won’t stop talking about it and they both want to rent bikes right away so we are heading to the location you recommended. When we are ready, I will gladly seek your advice on which bikes will best suit them and will sign on to your site to get the low down on safe and responsible riding on the road. You are doing a great thing giving people this wonderful gift. 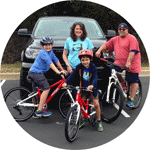 My family cannot wait to ride together and share that experience and you made it so easy for us. We are truly grateful and I am so happy we chose you to help make it happen for us. Wow what a great day for the boys! They learned so much today in such a short amount of time. Thank you so much for your insight and patience. Your kind manner immediately put them at ease and gained their trust. As a parent, it was thrilling to see how quickly they progressed. Tyler told me this was one of the best days of his life!! They are SO excited and would like to work with you again. We would love to do another Sunday soon, when you are available. So please let me know what works best for you. AMAZIIIIIINNNNGGG!!! From start to finish I learned what I was doing wrong and what to do right. When you really think about it at the end of the course, it is sooo easy and simple. Thanks Allan, you are THE BEST! This is Miles’ first solo ride, in front of his mom and younger brother. Mom is rather excited, and Miles is having a fine time. Jacob was so excited after your lesson. I was so amazed with his confidence boost after just one session with you–you are wonderful with kids! He was very proud of his ABC quick check & showed it to my husband. Thank you again! has led to embarrassment that I don’t feel comfortable on a bike. I finally realized that it was really quite silly. As a capable adult I have learned to do plenty of things and I figured it was about time to get on a bike. After a google search I was happy to find the adult learn to ride lessons from the CCE. I spent 3 hours with Allan on a Saturday morning and after that time my confidence, my skills, and my strategies were much improved. I will still need a lot of practice, but it has given me much more confidence to try. I would recommend it to any adult who wants to learn to ride. Patrick is a fine father, husband, marathon runner, and a successful professional. Like many people, he had never learned to ride a bike, so he got in touch with us. Within three hours, he had added this to the list of enjoyments in his life. I had so much fun today! Thanks so much for teaching me how to ride a bike once again; I’m so excited to re-enter this part of my life! I had learned to ride a bike when I was a child, but never rode very much because I was given a bike that didn’t really fit me. When I was older I was given a bicycle and could ride it, but never really learned how to control the bike well. Several years ago I got a road bike (with some friends who raced bikes trying to teach me), but I injured myself badly and became afraid to ride after that. After several years of looking at it, I wondered if I was just not meant to ride a bike at all. Anyway, I decided that maybe taking a lesson to learn to ride properly could help me get over my fear. Allan was wonderful! He was very kind and patient, and he loves teaching bicycle riding! I felt very, very safe in his care. He actually had me up and riding within just a few minutes. And I learned how to turn well, brake properly (I’d never learned that before), shift properly (ditto), signal in traffic, and inch forward. By the end of the session, we’d ridden through the neighborhood together, and I didn’t fall or hit anything! 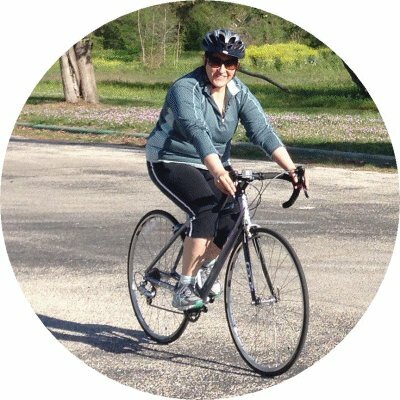 I cannot believe that after so many years of being afraid to get on a bicycle, that I now feel confident to practice on my own. It almost seemed miraculous. Allan is a really great teacher, and it was a wonderful experience. Good luck! It went incredibly well! 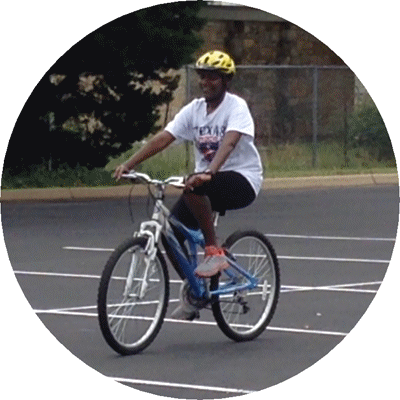 After the lesson, I circled the parking lot a few more times, and finally believed I could ride a bicycle. It’s a lot of fun and I hope to find some time this weekend to try my own bike. Thank you for your patient instruction. Hi, Allan. The riding is going GREAT! I bought a bike a few weeks after our lesson and I go riding several times a week. I’ve gotten comfortable riding in bike lanes in traffic (it took a while) and being able to go on evening bike rides in the spring has brought me much happiness. I am SO SO thankful for your time and the patience in the lesson. It’s been invaluable. Last week I was on a beach vacation and we rented bikes and rode to the beach daily and being able to do that made the trip so much better. All in all, learning to ride has been one of the best decisions I made and I couldn’t have done it without you. THANK YOU THANK YOU THANK YOU!!!! It was lovely to meet you and thank you so much for being flexible about the lesson. Samuel had a great time and commented repeatedly about both your patience and your detailed approach. 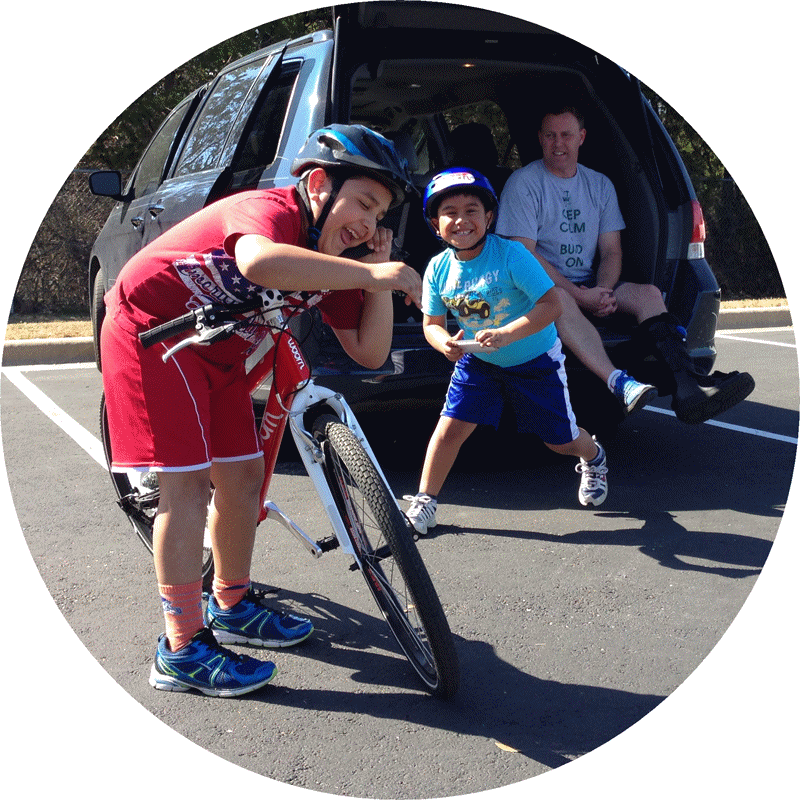 I was able to show Gabe my new moves on two wheels, he was blown away! I had such a great time yesterday, you are an excellent instructor, I honestly can’t thank you enough! We had tried everything to teach our 6 year old how to ride without training wheels. Running behind the bike holding into it was exhausting and he never built up the confidence to keep riding when we’d let go. Allan’s calm, comforting and knowledgable demeanor won my son over instantly. In just two sessions, Allan had my son expertly riding a two-wheeler and weaving through an obstacle course! [using tennis balls cut in half] We were able to take the nicking family vacation we had always dreamed of, thanks for Allan’s help! What an amazing bike and company! Our 8 year old son, Jacob was having a hard time learning to ride a bike (being born premature at 1lb-14 oz, he has had some motor skills development issues). This bike has boosted his confidence along with a lesson from Austin based Allan Dunlop at the Center for Cycling Education. 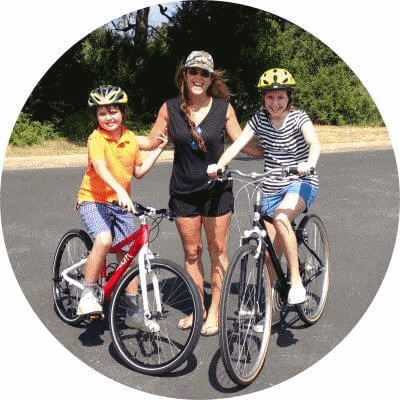 Jacob can now ride a bike–in just one lesson on a WOOM bike! Thank you Allan & Mathias!! When I was a kid my family and I used to go to my dad’s ranch and take our bikes with us, but for some reason I was really scared to ride my bike without the training wheels. After 20 something years, I decided to try it again. My husband gave me a bike lesson as a Valentine’s present, and I have to say that it has been one of the greatest presents ever! Allan is a very professional teacher, very patient and very intuitive. As soon as I met him I felt relaxed and safe. He taught me to trust in myself and take a leap of faith, and so I did! I had learned to ride a bike when I was a child, but never rode very much because I was given a bike that didn’t really fit me. When I was older I was given a bicycle and could ride it, but never really learned how to control the bike well. Several years ago I got a road bike (with some friends who raced bikes trying to teach me), but I injured myself badly and became afraid to ride after that. After several years of looking at it, I wondered if I was just not meant to ride a bike at all. Anyway, I decided that maybe taking a lesson to learn to ride properly could help me get over my fear. Allan was wonderful! He was very kind and patient, and he loves teaching bicycle riding! I felt very, very safe in his care. He actually had me up and riding within just a few minutes. And I learned how to turn well, brake properly (I’d never learned that before), shift properly (ditto), signal in traffic, and inch forward. By the end of the session, we’d ridden through the neighborhood together, and I didn’t fall or hit anything! I cannot believe that after so many years of being afraid to get on a bicycle, that I now feel confident to practice on my own. It almost seemed miraculous. Allan is a really great teacher, and it was a wonderful experience. Good luck!